Find a new crowd-favorite with our creamy Butternut Squash au Gratin. Our Butternut Squash au Gratin is topped with savory bacon and melty cheese. Cut squash lengthwise in half; discard seeds. Cut each half crosswise into thin slices; remove peels. Place squash in large saucepan. Add enough water to cover squash. Bring to boil on high heat; simmer on medium-low heat 8 to 10 min. or until squash is tender. Meanwhile, cook bacon in skillet until crisp, stirring occasionally. 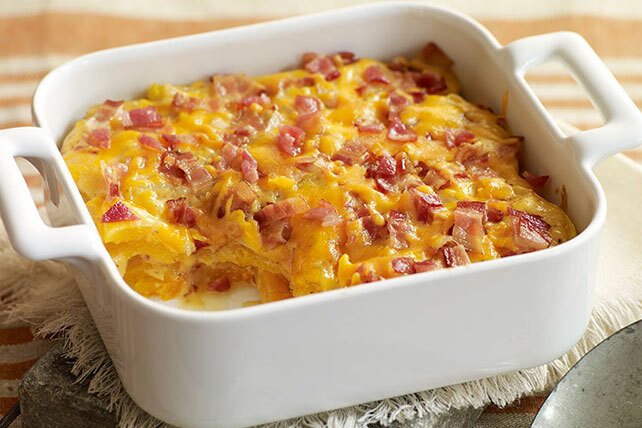 Remove bacon from skillet with slotted spoon, reserving 1 Tbsp. drippings in skillet. Drain bacon on paper towels. Add onions to reserved drippings; cook and stir 5 min. or until crisp-tender. Stir in flour and pepper; cook and stir 1 min. Gradually stir in broth; cook and stir 2 to 3 min. or until thickened. Remove from heat. Stir in 1 cup cheese. Bake 25 to 30 min. or until squash mixture is heated through and cheese is melted. This delicious vegetable side is sure to be a hit at your next party. Prepare it in an 8x8-inch Chinet Bakeware® baking pan, then secure the tight-fitting lid for easy transport to your potluck or other destination. The nonstick Chinet Bakeware® baking pan even doubles as a serving dish. And since it’s microwaveable, it’s the perfect pan for both storing and reheating any leftovers. Serve with hot cooked chicken, turkey or pork. Butternut squash has a smooth beige skin with slightly bulbous base. Typically weighing between 2 and 3 lb., this winter squash has an orange-yellow flesh with a sweet, slightly nutty flavor. To prepare, simply cut off both ends of the squash and peel before cutting squash lengthwise in half. Scoop out and discard the seeds and stringy fibers, then cut squash into cubes or slices as desired. If desired, squash can be cut up in advance. Store in tightly covered container in refrigerator up to 24 hours before using as desired.